Colourful, aesthetic, formable, cost effective, and formidable in strength having multiple applications, Uttam Spectrum is made from the best quality cold rolled steel coils, which are coated with protective metallic coating and multiple layers of organic coatings. Kohinoor Pipes & Steels is involved as the manufacturer and wholesaler of products like Prepainted Steel, Roofing Sheet, Steel Pipe, EOT Crane, Prepainted Galvanized Steel Coil and many more. We export Prepainted on Galvanised Steel basis, in coils/Plain sheets & corrugated sheets, and specialise in exporting the very thin PPGI galvanised corrugated steel sheets starting from a thickness of 0.14mm BMT upwards to Africa. • Most common widths of 762mm / 900mm / 914mm / 1000mm / 1220mm. Prepainted Galvanized steel refers that after the surface pretreatment of base plate, covering one layer or two layers organic coating on the surface with the method of continuous roller coating of paint, powder or film; and then drying and solidifying. We supply the full range of Pre-Painted Galvanised Steel (PPGI). Most of our PPGI is from KOLORMETAL and comes in coils, sheets as well as roofing and cladding profile forms. 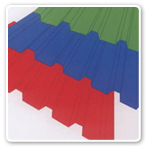 A wide range of profiled roofing accessories are also available that make us one stop shop for all roofing and cladding requirements.